Ordered the first time, came with 4 missing accessories. Got a replacement order, missing another accessory. Unfortunately already sent the first one back, otherwise, would just take out the missing accessory from the first toy that already came useless. Waiting on the third version of this toy, hopefully by the third try this toy will either arrive with all advertised pieces or my kid will just get over it and get herself a different toy. We really like this particular Childs bedroom set by Hape. It is simple but very attractive. I nice touch (which other brands don't do) is a double layered cover that you can slip the the dolls inside! I'm happy with the quality. The slide actual grabs on quite well. My 3 year old has no problem popping t back into place if she knocks it off, which is often. The toys are a cute addition. 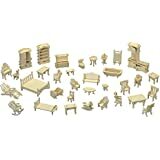 I have purchased most of their sets to furnish a Ryans Room Wooden Doll House. This and the other available room sets are well thought out in terms of what they include. The color pallet is also attractive. It is neither garish nor pale neutrals. The colors chosen appeal to both boys and girls alike. I painted panels of the Ryans Room "Home is Where the Heart" is House (taking inspiration from the Hape All Seasons Doll House) as i think it better sets off the furniture sets. 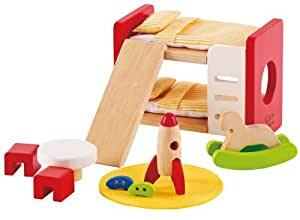 Bought this children's room set to use with the brand new wooden Ikea Flisat dollhouse. I was concerned about whether or not the scale of the furniture would work with the dollhouse since they're not made to go together, but they work great! All the little details (like the toys, rug, and removable slide) are so realistic and cute. We're giving this to my daughter (assembled inside the dollhouse) for her 2nd birthday on Saturday and I can't wait to see her reaction! I'll try to update once she's had a chance to play around with it for a while. 5.0 out of 5 starsPerfect Addition to the Hape Doll House! 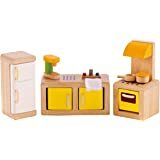 We got this to along with serval other furniture sets to go with the Hape Doll House we got our daughter. We looked at many doll houses before settling on this one. I wanted one that was wood and would look nice in a play room or in our living room. (We move often and were looking for flexibility). We got this for our 3 ½ year old for Christmas and she was just the right age for it. She was fully into pretend play and ready for a doll house. There were some very small pieces included that I do remove when younger children are around though. I hope to have many years of use out of this doll house. I recently ordered a few sets- some Plan Toys, some Hape- for my 3 year old DD's new dollhouse. 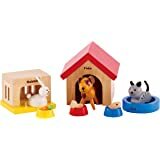 Although I thought the Hape sets were on average, cuter and more fun looking, I was skeptical because the review of the house said it was not very well made. When I opened the boxes and inspected them, I was pleasantly surprised. Both products seem equally well made. One of the things I had read was that excess glue was not cleaned up well. Well, that was equally true on both sets, though minor. I held off filling the entire dollhouse until this order arrived, and I am please to say that I will be buying more of the Hape sets.